This Saturday, my aunt Carol Mullan and I visited a few West End beaches to clean up the trash that was washing in. There was a lot of it. On the way home, I was telling my aunt that I had visited the public dock at Ely’s Harbour a few weeks ago and had been horrified by the amount of rubbish that was piled there. Both huge metal waste bins were overflowing and around them were huge piles of bags. We swung by to take a look. What a mess. The bins had been emptied and the bags collected, but look at the mess left behind. Debris stretched all the way out to main road below Fort Scaur. Carol suggested we return the next day [Oct 14] to clean up the area. I spend a lot of time cleaning rubbish off of Bermuda’s beautiful beaches, but admittedly, I would never have taken on this task had she not suggested it. These images show the area before and after we cleaned up the mess. How long did it take two ladies with gloves, a shovel and a rake? Ten minutes. Just ten minutes to leave an area much better off than the way we found it. As I was cleaning up the disgusting mess and screaming every time a cockroach emerged and scuttled about, many thoughts flashed through my mind. I am not an expert in trash removal, but clearly, for a public area to end up looking like this, there is a problem. What are your thoughts? Here are some of mine. These bins were not emptied for a very long time. I do not know the length of time, but the accumulated trash would indicate it had been many weeks. Ely’s Harbour is one of Bermuda’s most beautiful bays. Every day, islanders use the public dock. Every day fishermen and other boaters walk by the piles of trash, and I guess maybe it doesn’t bother them, or maybe it does bother them but they don’t do anything about it. Maybe someone, or lots of people have tried to do something about it. Whatever people thought, they continued to add trash to the area. Eventually there was so much trash that people just started dumping stuff there. Soda cans, batteries, cans of paint, metal, old tools, plastic bottles, foam containers, beer bottles, fishing line, fishing poles, bait bags and piles more of pretty vile stuff was just continually added. Does this seem like an intelligent thing to do? If you keep adding trash to an area that is overflowing with trash, you are just adding to the problem. I hate to have to repeatedly use the word ‘problem,’ but the problem with trash disposal is that many people seem to think it is not their problem. Put the trash out in bags, or even not in bags, and someone will deal with it. I would say that this is way of thinking is a big problem. Yes, people are employed to collect our trash, but they are not employed to clean up the mess left around the bins. Should they be? Regardless of what we think, it is our responsibility to ensure that our trash is properly disposed of in a way that garbage collection is as straight forward as possible for those collecting it. I am not sure who is responsible for collecting the trash at Ely’s Harbour, but I do know that the accumulation of trash at docks and ferry terminals has become an island wide problem. I have heard so many times that our Government does not have the funds to employ people to regularly [or even occasionally] keep these areas clean. How can this not be a priority? 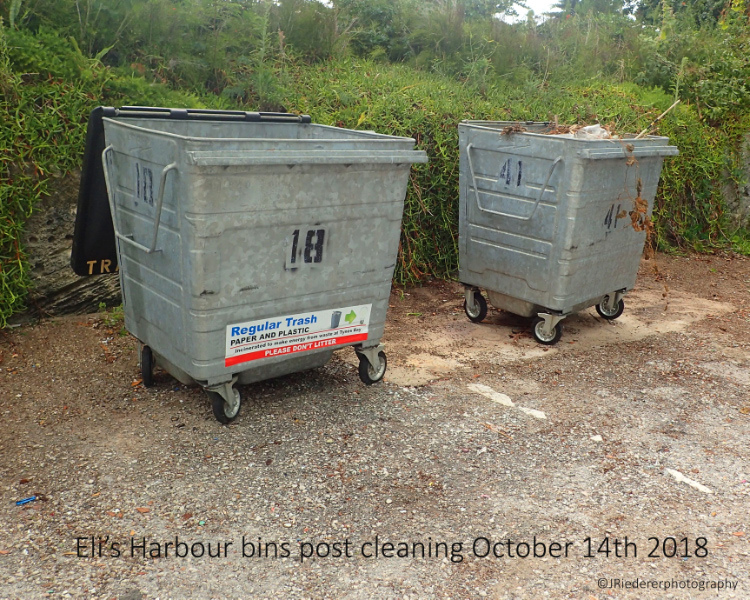 How can keeping our public docks and ferry terminals clean and tidy, not be a priority? We just had a world class sailing event here. How is this world class? Here is another way of thinking. How about not depending on others to solve our trash problems? How about taking pride in ourselves and our island and especially in places that we regularly visit. How about keeping these places clean by not leaving our trash there and by picking up and properly disposing of trash we find before it accumulates? We have a dump in Bermuda. Everyone must know this right? I visit the dump every week with all of the trash I regularly collect from beaches – and my trash as well. Do we really need to dump our trash in public spaces when we have a dump that is so easily accessible to us [and even open on Saturdays]? Did you know that more than half of our world’s population does not have the ‘luxury’ of regular trash collection? Many Islanders were outraged when our trash collection days were reduced. You would think this would provide us with the motivation to watch what we are purchasing and try to reduce the amount of waste, especially plastic, that we are creating. Instead, the dumping in public places seems to have increased. I run the Southampton railway tracks a lot. I have noticed more and more dumping in the foliage bordering the tracks. I pulled a microwave out of the bushes the other day. It seems that if someone throws a can or bottle into the bushes, others see that can or bottle and then assume they can throw their trash there as well. Does this seem like sensible behavior? 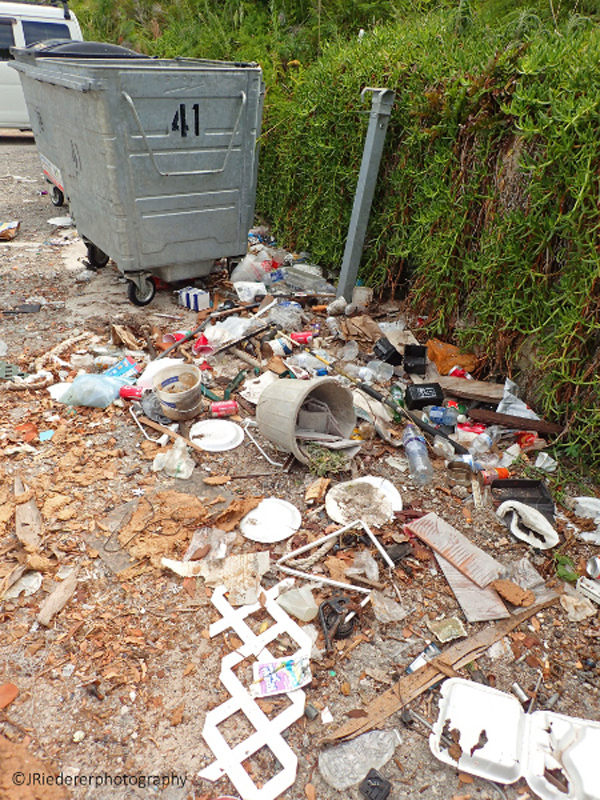 Illegal dumping is occurring all over our island. I see it in our parks, our docks, ferry terminals and even piled under signs that say ‘Please do Not Dump here.’ All over our world, our mounting waste problem is one of the biggest issues facing our planet today. We need to stop assuming the waste problem is someone else’s problem and do what we can to reduce the amount of waste we are producing. We need to start [or continue] to make smart choices when it comes to purchasing. We need to reduce the amount of single use plastic we are bringing into our lives. We need to keep our public areas tidy, not just for our benefit but for our visitors as well. Bermuda is supposed to be one of the most beautiful islands on our planet. If we continue with our wasteful practices it will not be for long. 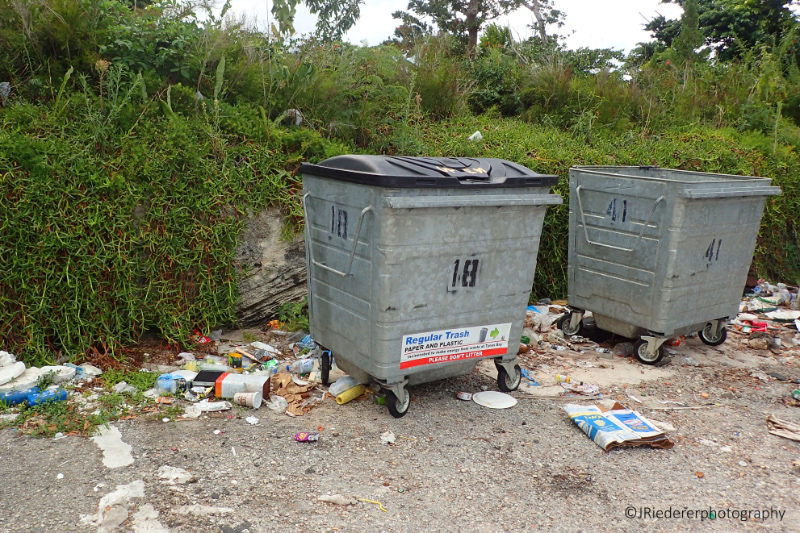 A huge shout out to everyone who does what they can to keep Bermuda beautiful. Im sure there was a problem before, but thanks to our current govt cutting back trash days has assisted the escalating problem. Thank you for your selfless effort in cleaning up that eyesore. If you want thoughts , well , here’s mine . There a many locations around the island similar to that one where people use the public dumpster area as their own personal trashing ground. In very short order all manner of items start showing up that ought to be taken to the special dumping facilities . Fridges , auto batteries, paint , household furniture , I’ve even seen water heaters and safes dumped around them . And we won’t even go there about how once the dumpsters are full people just toss the garbage on the ground. I too am familiar with the dumping that goes on in the bushes lining the railway trails as well . The problem is , as soon as good people like you come along and clean up the mess the slobs who left it there in the first place all smile and say ‘See , it does give someone else a job !’ Believe it or not that quite literally is what they’ve been taught growing up . That throwing their trash is perfectly acceptable because it give someone else a job. Almost hard to believe isn’t it ? Anyway , as fast as good people clean it up it will be replaced with more , it’s an exercise in futility. It seems that very , very few people really have the pride in their island that they say they do. You are 100% correct. I praise Jessica for doing this but she is getting exploited herself. The fact is that our gov’t does have the funds but they choose to spend it (some may say waste it) on other things like giving a former PLP Premier $1.2m. Hello- i agree. Thank you for your comments. I think we have to start somewhere though, right? Education is key. Thank you. Firstly, thanks for your efforts. My thought is to stop this bad behaviour, put up cctv by these dumping spots and catch the people doing it and fine them! I wish we could put up CCtv. I agree. It would be interesting to watch, that’s for sure. Thank you. I dont think it would be hard or cost to much to put up cctv in the worst areas. Perhaps a call to your local mp to suggest it might help. I will do the same. The problem is caused by anyone who doesn’t accept responsibility for disposing of their trash properly or who doesn’t feel the responsibility to clean up when, regardless of the situation or circumstance, our trash gets into a public space. It could be that chickens or dogs tear into the trash bag we left curb-side… still our responsibility. If a dumpster is provided for our convenience, then our responsibility is to make sure that our trash is contained in a sealed bag so that when the dumpster is emptied loose trash doesn’t go everywhere, like in the photograph, because then whose responsibility is it to pick it up?? If everyone just did the right thing, we could spend more time enjoying the beauty of this place… or in solving the many more complex problems we have on the list. I completely agree. Thank you for your comments. Thank you soooo much for cleaning this up. When I got for my walks now I carry a plastic bag to pick up trash. It is very sad to see how much I collect! Well done ladies. You deserve a huge thanks. This problem is like so many others in Bermuda. The little laws are broken day after day, yet no-one ever calls anyone out over it, so becomes acceptable. Then the next slightly more serious law is broken, and then that becomes acceptable, and so on and so on. I watched a bike with two females on it (guessing local as not a rental bike) went straight over Church Street and down Parliament before turning right onto Reid without a care in the world. At the bottom, they tooted and waved to a friend who walked away laughing. Using a cell while driving is now the norm. Not using indicators is the norm. Drink driving has long been the norm. Double parking, dumping of trash anywhere, gun murders, fights between school kids, all have become the norm. One might say that this is the start of a decline in society, and it’s not a huge leap to look a little way into the future to see where we might end up. Totally agree. The problem is , we’ve been slack and turning a blind eye on the small stuff for decades. So much so that half the population doesn’t even know what the basic laws are. They grew up around people who did what they wanted to with impunity so they now think it’s right to do whatever they want to. And woebetide anyone who calls them out on it or charges them for an offence . They’ll be all over their MP threatening to never vote for them again . It’s all about politics. What a mess we’re in now . Public floggings of anyone caught illegally dumping and littering. That will get attention. Charge an entry fee and you can reduce the deficit. Ta da! Ever noticed how poor areas of a town or city are full of trash? Ever noticed how there’s less dog crap on the sidewalk in wealthier areas? And let me tell you, it has nothing to do with availability of refuse services. As a Bermudian i am pretty disgusted at the number of my fellow Bermudians (of all races) who drop trash at their feet when there is a bin or dumpster 3 feet away. 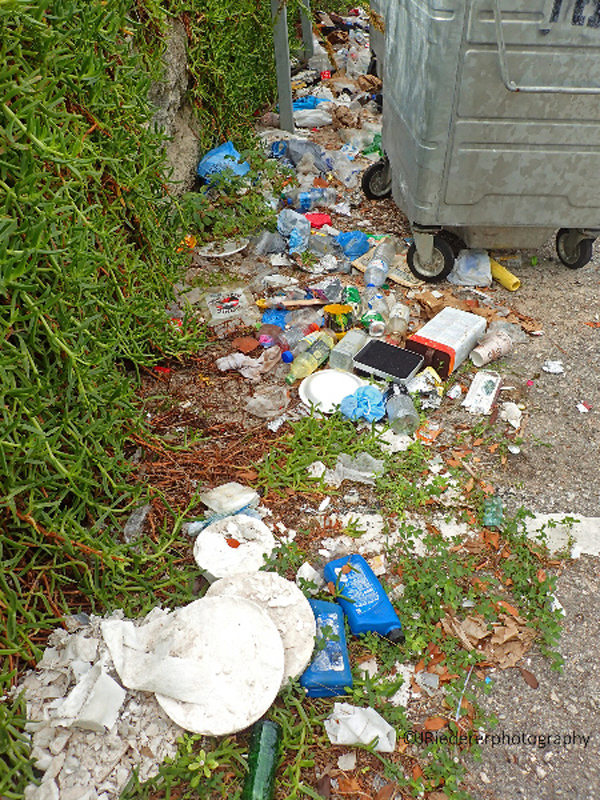 With all the PLP hyperbole of keeping Bermuda for Bermudians and such, I would love to see the BIU or PLP organize a Bermudaful day and have their members clean up an area. Here’s the problem in a nutshell people just don’t care what this island looks like. Most areas that have bins are overflowing. Look at the one at Watfird Brudge as soon as it is emptied. the next couple of day it’s running over. With the 1 day collection this is not working. People from near and far are coming over Watfird and dumping their trash in the bins and when they are full they dump on the ground. This area is very much in the public eye. Non-Mariners race is a large contributor to trash in Bermuda waters and recreational boaters in Mangrove Bay and nearby islands who just dump their trash overboard!!! Thanks to the Ladies for their efforts and effects ! People drop trash wherever it’s easy to get away with it ! If only they had some pride ! This problem is not political. ! 1. Occasionally, the trash is not packed up on the day of collection. I can tell when there is an empty cardboard box in the dumpster, that can be easily identified, and I see it there for more than 2 weeks. This also is a cause of the overflow – the trash had not been collected. 2. As said above, people put items at the dumpster that do not below there and I’m quire sure is against laws and regulations. Car/boat batteries, household Fridges, household funichor – I’ve seen them all with the desire to set up my own spy cam and catch who is doing it. When the trash collection was twice a week, I did not see the dumpsters overflowing as in the pictures above. There were occasion when the trash was not collected, but the next collection day it was picked up. At most, the dumpster would be full in such situations. But now, with the weekly collection, if they are not emptied on collection day for the area, it becomes 2 weeks between pickups. this would also explain the smell I’ve noticed – the trash been there for 2 weeks (sometimes more!!!!) has had plenty of time to rot. US States use prisoners to pick up trash by the side of highways. Presumably there is some sort of compensation in the form of payment per bag collected or even time taken off in parole consideration. Docks are the first place to leave trash for many people who live on boats and smaller islands, who may not own cars. This may explain why some batteries and old appliances end up there. Government should make it easier for people to dispose responsibly by creating a few drop-off points for e-waste and batteries around the island. The money’s not there? Stop paying senior civil servants 150-180k a year – most people would support that. It would not take a little effort for collectors of garable to have some tools like broom and shovel to tidy up spillage of trash that happen time to time on particular site as a part of service. No one is being direct to manage such thing when it occurs. I remember at one time this was a regular part of service of the particular operation and need to be reinstituted. Dirt…cameratise it then name and shame these dirty dirty…people of dirtness…piggywigs….